The SLANT TURN 800 is available with a variety of spindle bore sizes to meet the requirements of a wide range of shaft workpiece requirements: Φ180 mm (standard), Φ260 mm, Φ375 mm and Φ560 mm – largest spindle bore for this turning center class. For the efficient machining of large, long shaft workpieces, the avaiable machining lengths are 2044mm（2000U, ） 3064mm（3000U,） 4084mm（4000U）, and 6124mm（6000U）. High rigidity turret with a total of 15 ID and OD turning tools for the efficient heavy-duty machining of a wide range of workpieces. Large φ510mm steady rest can be mounted. 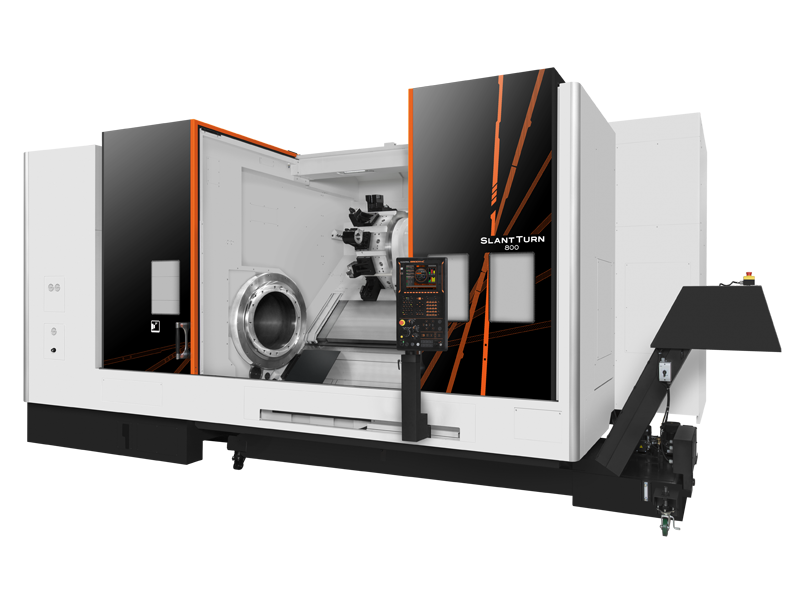 The MAZATROL SmoothG CNC is equipped with the thermal shield and the Mazak voice adviser.